[Fig. 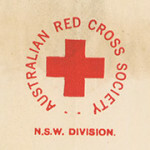 1] Australian Red Cross Society NSW Division logo. From NRS 12060 [9/4697] letter 15/956. Although the New South Wales Division of the Australian Red Cross Society undertook numerous and varied activities throughout the State during World War I, there are comparatively few references to them in the State archives collection. Most of the Red Cross correspondence is clearly labelled with the Red Cross letterhead [Fig. 1] or stamp. Some correspondence can be located in the Premier’s and Chief Secretary’s Department. Within the Premier’s Department references to the Red Cross can often be found in NRS 12060 Letters received. The correspondence mostly relates to the first few months of the war in 1914 and into early 1915. For these early months of the war, there are numerous references to Red Cross goods being sent overseas.[Fig. 2] The generosity of the people of NSW was demonstrated by the fact that over £55,000 worth of goods, including motor lorries, clothing, blankets and foodstuffs were shipped out by the end of January 1915. [Fig. 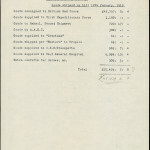 3] (1) A summary list from 12 January 1915 includes a breakdown of where goods were sent, including supplies to the Australian Naval and Expeditionary Force, No. 2 General Hospital, the British Red Cross Society in London and comforts for enlisted nurses. [Fig. 2] List of goods sent by NSW Branch or Australian Red Cross Society to London, October 1914. From NRS 12060 [9/4697] letter 15/956. [Fig. 3] Summary of goods shipped by NSW Division of Red Cross up till 12 January 1915. From NRS 12060 [9/4697] 15/956. [Fig. 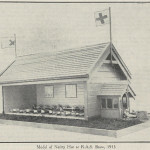 4] Model of Netley Hut at RAS Show, 1915. From NRS 15298 Item , p.357. [Fig. 5] Letter to Premier from Lady Edeline Strickland, 13 October 1914. 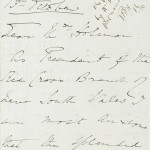 From NRS 12060 [9/4697] letter 15/956, p.1. [Fig. 6] Letter to Premier from Lady Edeline Strickland, 13 October 1914. From NRS 12060 [9/4697] letter 15/956, p.2. [Fig. 7] Letter to Premier from Lady Edeline Strickland, 13 October 1914. 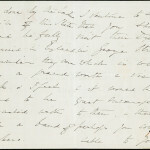 From NRS 12060 [9/4697] letter 15/956, p.3. [Fig. 8] Letter to Chief Secretary from the Sutton Forest branch of the Red Cross asking for permission to hold a dance. From NRS 905 [5/7480] letter 16/57688. [Fig. 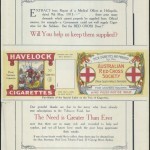 9] Red Cross cigarette flyer, 1914. 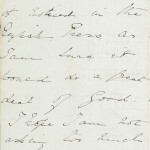 From NRS 905 [5/7260] letter 14/1812. [Fig. 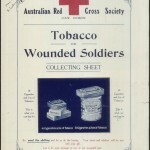 10] Australian Red Cross Tobacco for Wounded Soldiers Collecting Sheet. From NRS 905 [5/7481] letter 16/57824, p.1. [Fig. 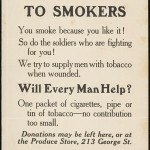 11] Australian Red Cross Tobacco for Wounded Soldiers Collecting Sheet. From NRS 905 [5/7481] letter 16/57824, p.3. [Fig. 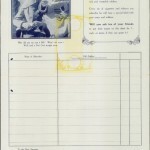 12] Australian Red Cross Tobacco for Wounded Soldiers Collecting Sheet. From NRS 905 [5/7481] letter 16/57824, p.2. [Fig. 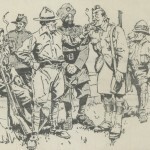 13] Sketch of soldiers smoking from The Overseas Club flyer. From NRS 905 [5/7481] letter 16/57824. 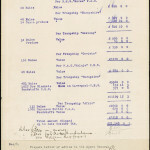 (1) State Archives New South Wales, Premier’s Department; NRS 12060 Letters received, [9/4679] letter 15/956 29 January 1915. (2) NRS 12060 [9/4697] letter 15/956 (letter 15/6300 4 Feb 1915). (3) NRS 12060 [9/4697] letter 15/956 29 January 1915. (4) NRS 12060 [9/4697] 15/956 13 October 1913. (5) NRS 12060 [9/4697] letter 15/956 Cost of telegrams. Outgoing telegrams (in total 8) cost nearly £31 and incoming telegrams (in total 7) cost over £21. 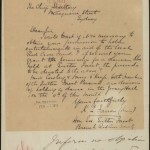 (6) SANSW, Chief Secretary; NRS 905 Main series of letters received, [5/7480] letter 16/57688. (7) Details of special fundraising days, such as Red Cross Australia Day in 1915 and 1918 can also be located in NRS 906 [5/5293]. (8) NRS 905 [5/7260] 14/1812. (9) NRS 905 [5/7481] 16/57824. (10) Scott, Ernest, Official History of Australia in the War of 1914-18, Vol. XI, 7th Ed., 1941 (Ch XXI), https://www.awm.gov.au/collection/RCDIG1069950/, accessed 2 May 2015, p.705.